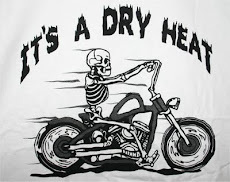 Driving down the road this fine Saturday in the desert I saw a sign for a garage sale. I don't normally go to these because I haven't had much luck finding anything of interest, but a couple of weeks ago I stumbled on a really cool clock (more below) and thought, "what the heck?" 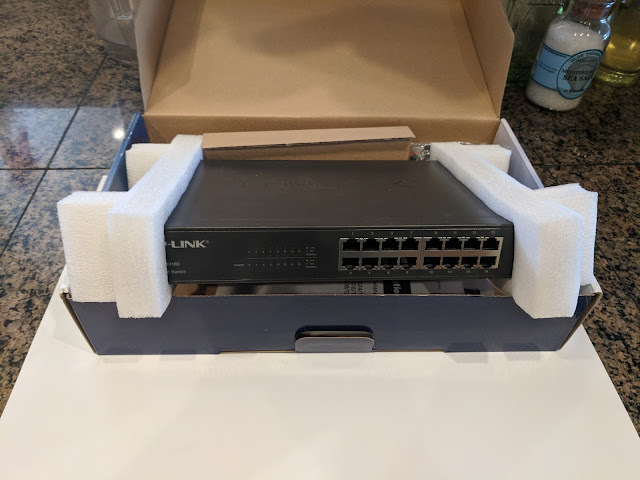 Sitting on a table being ignored by the other customers looking for the perfect piece of glassware, child's clothing, big crescent wrench or first printing Gutenberg Bible was a 16 port gigabit TP-Link Ethernet switch. Trying to hide my excitement I asked the owner, "How much?" "How about five bucks?" Brand new, in the box, ready to go on the shelf where all the little computers are. I've been thinking about getting one to support all the little computers that seem to be breeding over there. Right now I'm down to the last port on the switch that handles them and the next one would require this or something like it. Five Bucks?! This particular one is $76 on Amazon right now. Score! I like to have anything I can connected hardwire into the house ethernet because I don't have to worry about how far away the nearest wireless access point is. This addition to the 'little computer shelf' will help out a lot. 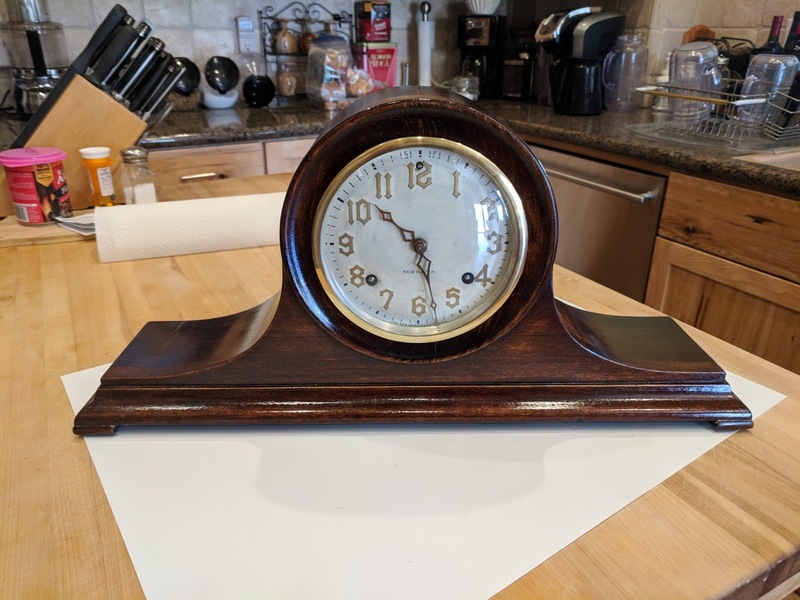 The clock I mentioned above was an impulse purchase I made a couple of weeks ago at an estate sale. Estate sales are sad (at least to me) because someone passed away and a company is liquidating their belongings. I always get a little stuffed up when I wander through them thinking about the pleasure the items gave their owner, and I usually pick something out that probably had some meaning to them so I can help a little bit in keeping a tiny piece of history around. OK, it doesn't fit my image, and I'll never say that out loud. 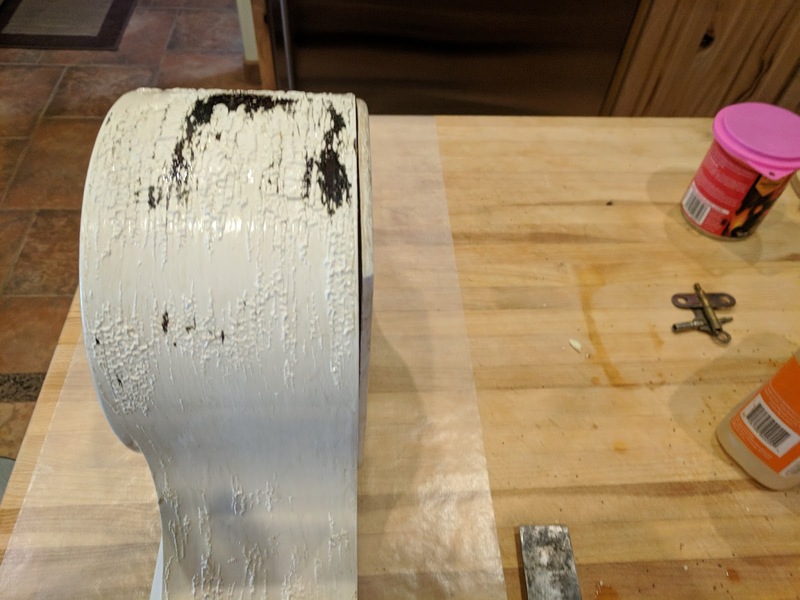 The white paint had brush marks in it and the brass was tarnished. There were a couple of chips here and there, but they had the key and it ticked. 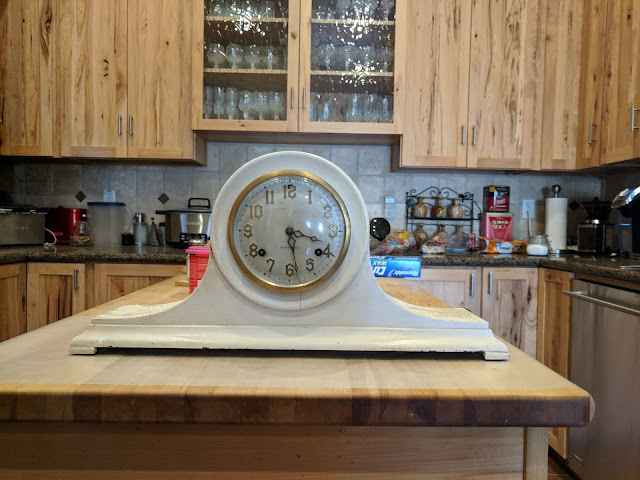 I had a new old clock. The grain on the wood looked OK and it appeared to be a mahogany laminate on the top of the tambour (curved part) with solid mahogany for the trim. So, I took the guts out and dug in. 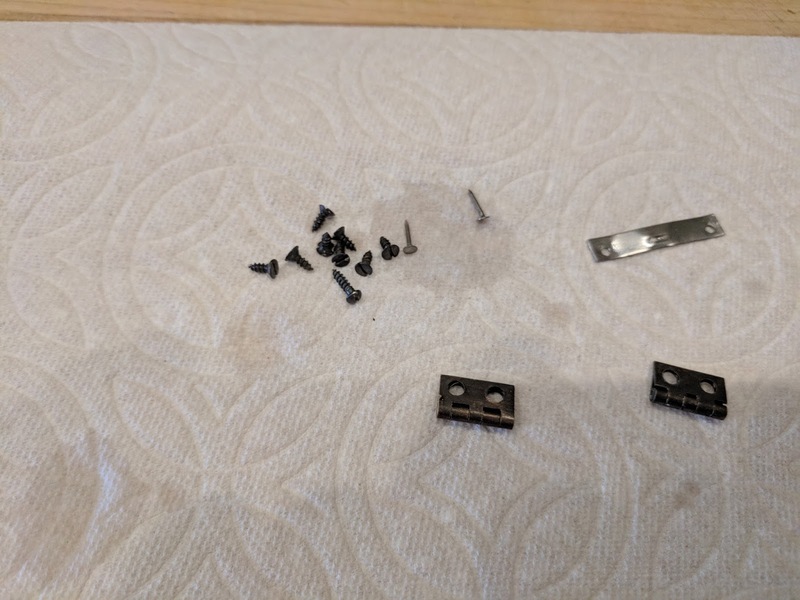 I didn't want to post the parts and pieces of the clock and chimes because that would have meant taking them out of the Ziploc bags I put them in the instant I got them loose. Losing a single little part could have been a disaster and would have certainly dropped the value of the restoration. You don't use new parts on something you're restoring if at all possible to keep it original. 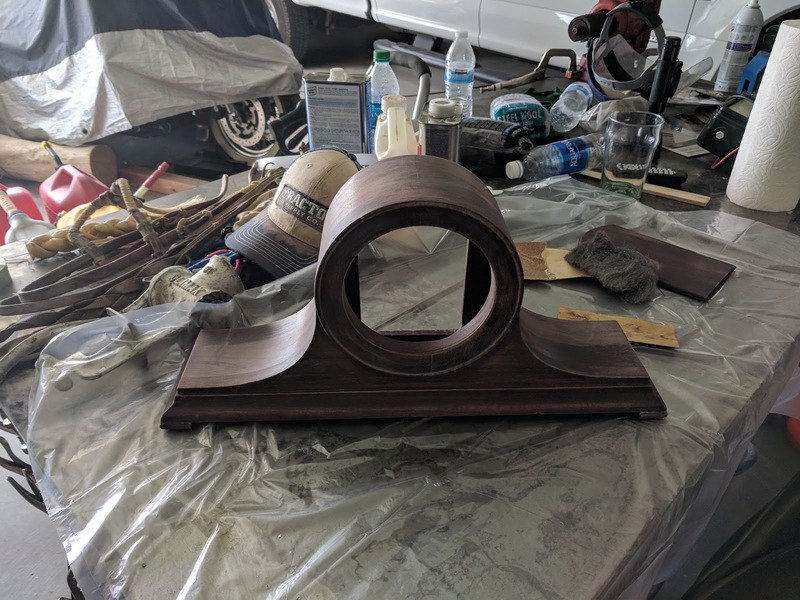 I realize that tambour mantle clocks are not of great value and I wouldn't get much profit if I were to sell it on ebay, especially since shipping would cost as much as I paid for it. But that wasn't the point. Now my family holds a little piece of another families history that we can care for. At least until the estate sale. Two great finds! As to the clock, time to gut the works, replace with a stepper motor and ESP8266 to supply NTP accuracy :) Just kidding of course. I thought of doing that as well, to one of those huge wall clocks. Problem is, most of those utilize one of those cheap rectangular sealed boxes into which you insert one to four AA battery(ies). I think you can tie-in to the setting knob as a hack, easier than replacing the box. Then you'd have to either have a rotary encoder or have the software flash the time it updates every minute in the event of power failure/internet outage so the ESP8266 knows where the clock's hand were last located in order to provide the delta to correct itself. I have downtime now, I may look into something like this. No POE switch on it. I did look for that, but the location I'm going to use it in has plenty of power for the devices it will serve. Later, I may want POE for some spots. Maybe another yard sale?? 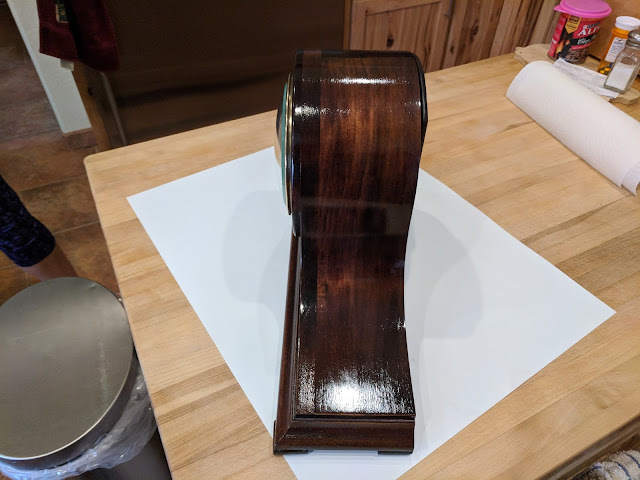 Meanwhile, I looked into a clock project that used the GPS satellites like the one I have in the attic and found out that for around $20 I can convert any of the electronic clocks to use the time standard transmission coming from Boulder. That's cooler than anything I could do with a servo motor, and a lot cheaper. Link for the WWV clock conversion? If you do the same thing on Google, there's one company that makes a really elaborate one that updates several times a day and is supposed to be awesome. I have zero experience with any of them except for drooling a bit.